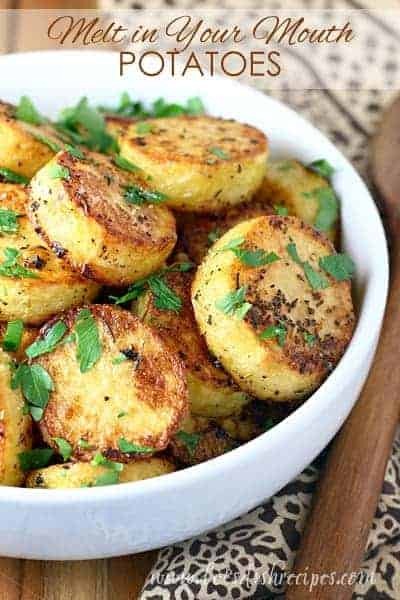 SLOW COOKER PARMESAN GARLIC POTATOES — Small yellow potatoes are coated in olive oil, butter, garlic and seasonings, then slow cooked until tender and tossed with Parmesan cheese before serving. 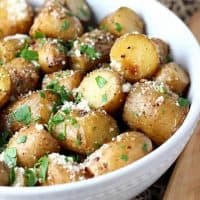 I can never go wrong when I serve a potato side dish at my house, and my family loved these easy to make Slow Cooker Parmesan Garlic Potatoes. With just a handful of simple ingredients, plus a slow cooker, you can have a satisfying, savory side dish on the table with practically no effort at all. My kind of recipe! Aside from cutting your potatoes in half, there really isn’t much work involved in this dish. The slow cooker does the work for you. I love that my oven is freed up for other things. This is especially true during the holiday season. Oven space is always at a premium when I’m cooking a big holiday feast, so if I can utilize my slow cooker, it makes things so much easier. 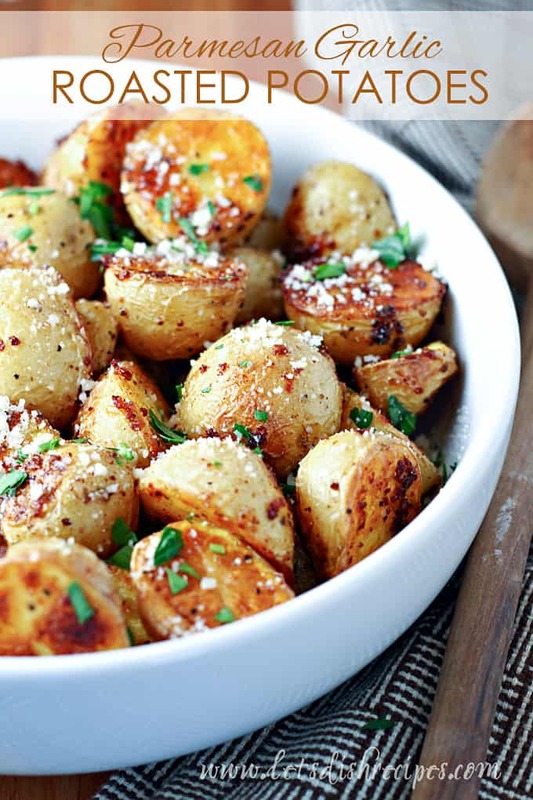 And these Parmesan coated potatoes are definitely tasty enough to serve at a holiday meal. But they’re easy enough to serve any night of the week. I really like using a yellow potato, like Yukon gold, in this recipe, but any variety of potato should work. If you can’t find small potatoes, just cut regular sized potatoes into large chunks and follow the recipe from there. Although you could get away with all butter or all olive oil, I really like the combination of the two in this recipe. And you can certainly change and adjust the seasonings to suit your tastes. The Parmesan cheese is a must though. Because, well….it’s cheese! And the sprinkling of fresh parsley really brightens up the finished dish, so I highly recommend that as well. Although almost any fresh herbs would work. If you’re looking for a simple, crowd-pleasing side dish that you can serve any time of year, these Slow Cooker Parmesan Garlic Potatoes are a must try! I hope you enjoy them as much as we do. 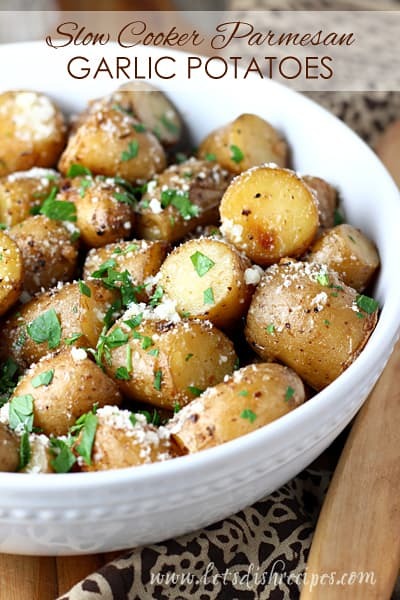 Be sure to save this recipe for Slow Cooker Parmesan Garlic Potatoes to your favorite Pinterest board for later. Lightly grease a slow cooker with non-stick cooking spray. 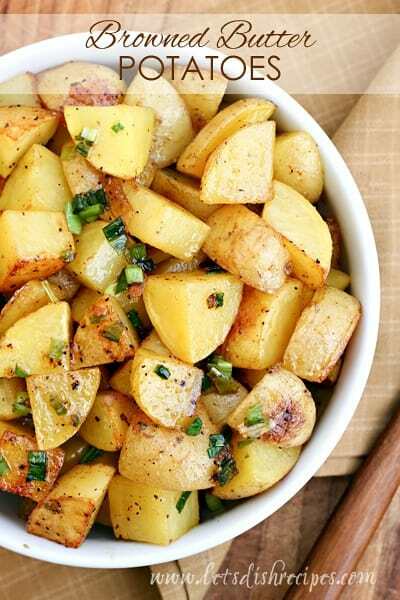 Place potatoes, olive oil, butter, garlic and seasonings into slow cooker and toss to coat potatoes well. Cover and cook on low for 5-7 hours, or on high for 3-4 hours, or until potatoes are tender. Stir every few hours. 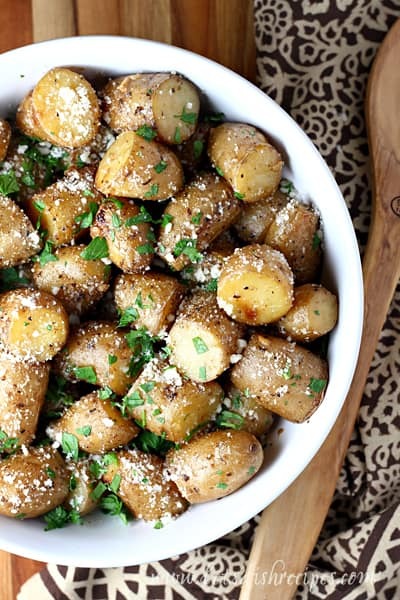 Transfer potatoes to a large bowl and toss with Parmesan cheese and parsley. Re-season with salt and pepper, if needed. Serve immediately. Perfect side dish! Super easy and delicious! Oven space is always at a premium! Love a slow cooker option for a side. Thanks, Danelle!